Video games can make relationships complicated. I could just as easily say “macrame can make relationships complicated” or “working in a restaurant can make relationships complicated”. Any time-consuming hobby or job necessarily requires you to take time away from your significant other. This is neither good nor bad, just a thing that happens. Something they don’t tell you about getting into a serious relationship (not to mention getting married) is that not all of your interests may align. I’ve found that this is for the best; something about variety being the spice of life. You don’t have to spend every waking moment together, and you don’t have to share the exact same set of hobbies to have a deep and meaningful relationship. On the other hand- being flexible allows you to discover interests that you may have never found out by yourself. My wife loves botanical gardens; now we have memberships to two different ones because it turns out I enjoy them too. It’s amazing to discover something new as an adult. Even more of a pleasant surprise if you actually enjoy that new thing. My wife didn’t grow up with video games, with the exception of the adventure games based on the Nancy Drew series developed by Her Interactive. She’s not dismissive of my hobby/ potential career path (who knows! ); she actively encourages me to tell her what I’m playing or working on. Recently I helped write a review for Kirby’s Dream Land, and when my wife and I watched the video together she said “that game looks so cute! I wonder if I could play it” and wouldn’t you know it, there’s an updated version in the form of Kirby Super Star on the SNES classic. One of the great things about Kirby games is that the stakes are pretty low for the most part. Unless you’re going for 100 percent of collectibles or speedruns or something, they tend to be more accessible, especially for people who don’t play a lot of games. One thing I love that they added in Super Star is the extremely cute tutorial, a little stage play with fantastic music that gives people unfamiliar with the game the chance to figure it out. Prior to playing this game, my wife had never even held an SNES controller, so this tutorial was necessary. I’ve mentioned before that for people who didn’t grow up with video games, modern controllers can be seriously overwhelming. Fortunately, Super Star doesn’t use all the buttons and my wife was able to handle getting around just fine. Kirby Super Star really is the perfect way to kill an hour or so with a partner. The game contains a condensed version of Kirby’s Dream Land with updated mechanics and few stages. In this version, called Spring Breeze, Kirby uses his iconic copy ability for himself but can make a copy of enemy, controlled by Player 2, anytime they wish. There is no limit to how many times this can happen in a game, which makes it fun for someone with limited experience to dive in. My wife liked being Waddle Dee, and honestly did more work on the bosses than I did for most of the game. It was therapeutic, in a way. Just enough challenge to be moderately interesting, but easy enough to blow through in one sitting. After we played through Spring Breeze, I went off to work and my wife texted me later to say how much fun she had playing the game with me. It made me happy, and helped me appreciate what Masahiro Sakurai was envisioning when he said he wanted to create a game that anyone could enjoy. 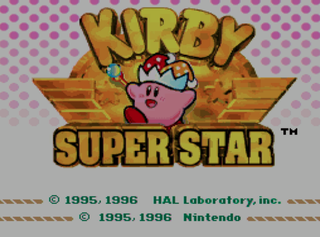 Kirby Super Star is not the first game we’ve played through together, and it definitely won’t be the last. But it might also be one we return to more than once. If you’ve got a SNES or SNES Classic lying around an afternoon to while away with a loved one, you could do a lot worse than the both of you spending it with Kirby.